At what seems like today to be an extremely slow, but compassionate pace, Mr. Rogers introduced us to another world — one where everyone was special, loved, appreciated and affirmed. Mr. Rogers and his friends, King Friday XIII, Lady Elaine, Mr. McFeely, Daniel Striped Tiger, and the trolley, seamlessly move from his make-believe world into the real world. It has been 15 years since the death of the Rev. 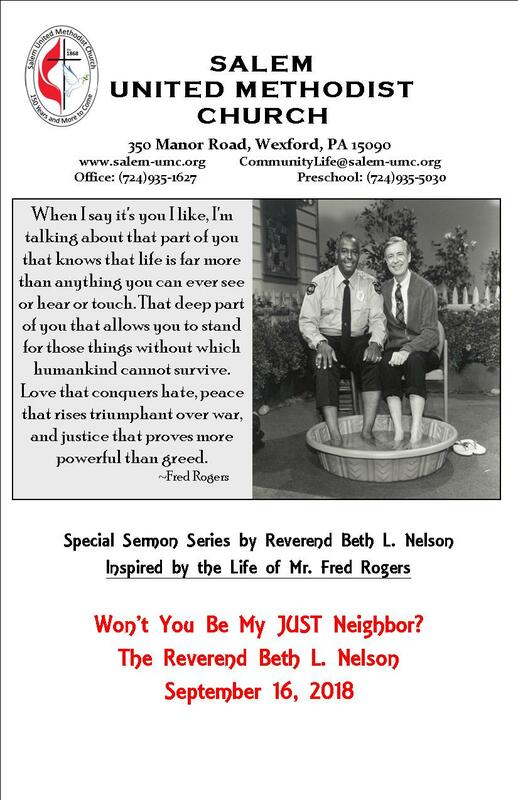 Fred Rogers, an ordained Presbyterian minister, and the 50th anniversary of The Neighborhood. The show debuted in 1968 and I was 13 years old. I confess…I never watched the show. But 1968, it was a time of change and uncertainty. It was shortly after the assassinations of President John F.
Kennedy, Robert Kennedy, and the Rev. Dr. Martin Luther King, Jr. It was a difficult time in our nation. cardigan sweater, each one made by his mother. And with his uniform of a sweater and a pair of sneakers, he helped us imagine the kingdom of God through make-believe land, puppets, stories, and simple, meaningful songs. Rogers tried to see and create the peaceable kingdom. His calm nature, even in reruns, give forth a since of calmness so needed in our world today. Mr. Rogers was always preaching but people did not always see it. A beautiful, yet innocent invitation is offered every time we hear the theme song, “Won’t You Be My Neighbor?” We all need to practice “neighboring.” Neighboring can be a challenge and frustrating. I had a neighbor once who wrote nasty notes and left them at my front door. The previous pastor had made a point of zigzagging the lawnmower where the two yards met. She loved her yard and took great pride in her lawn. She had called the police on the previous pastor, so I already had a few strikes against me. She wrote note after note explaining to me that dandelions were not flowers. She tried to shame me into killing them off so the seeds of these resurrection flowers would not blow into her yard. She was on me for at least 10 years, and I would often catch her in my yard digging them up. I gave her blanket permission to dig away. Her yard looked beautiful and it was always in perfect shape. My yard was 5 times the size of her yard and it got cut when needed and was presentable. Our only neighbor conversations were about weeds for over 10 years…until one night, she knocked at my door. Her mom was dying and she wondered if I would come over and pray for her. I didn’t even know that her mom, who was well into her 90s, lived there. I was not a good neighbor. When I sat down beside her mom to pray, I was sure her mom had already passed away. But I prayed anyway and gave thanks for her life and the devotion of a good daughter. We never talked dandelions again. Not really sure I ever saw another dandelion in my yard…But I had a neighbor that brought me vegetable soups and tomatoes from her garden. We had pleasant conversations and she was sad when I moved away. 10 years were wasted…I learned slowly to be a better neighbor. In general, I can fulfill the commandment to love my neighbor. I live in a great neighborhood. Next door neighbors are easy to love. But Jesus broadened our concept of neighbor. Our neighbors are those who do not look like us. Our neighbors are those with different faiths. Our neighbors are homeless. Our neighbors are Cleveland Browns fans. We need Mister Rogers’ invitation: “Won’t you be my neighbor?” and we need to heed it. Mr. Rogers made it seem so easy. Look at this clip from one of his early shows. It was from an episode that aired in 1969, in which Mr. Rogers had been resting his feet in a plastic pool on a hot day. In 1969, my parents did not allow me to go into the swimming pool at Kennywood because children of color were swimming there. But this is a touching scene. Barriers are broken down…justice is seen as a normal part of life. “He invited me to come over and to rest my feet in the water with him,” Clemmons recalls. “The icon Fred Rogers not only was showing my brown skin in the tub with his white skin as two friends, but as I was getting out of that tub, he was helping me dry my feet.” Mr. Rogers used the towel that Officer Clemmons used. That simple act seemed very sacred to me. Francois Clemmons says: “I think Fred Rogers was making a very strong statement. That was his way. I still was not convinced that Officer Clemmons could have a positive influence in the neighborhood and in the real-world neighborhood, but I think I was proven wrong,” he says. opera roles and founded the Harlem Spiritual Ensemble. meeting people where they are, is a great step forward in being the neighbor Jesus calls us to be. A PBS children’s show featuring a man in a cardigan and Keds, playing with puppets, and singing songs about feelings may seem too slow for our fast-paced world. But I know that we still need that peaceable kingdom to inspire us, and I trust that the long-term neighboring work can be work that will involve us all.